Kirk Robert Nieuwenhuis was born on August 7th, 1987 in Santa Monica California. The six foot three outfielder played three seasons at Azusa University where he set school records in runs scored (190) & triples (12). He led his Cougars team to back to back NAIA World Series titles there as well. He was drafted out of Azusa by the New York Mets in the third round of the 2008 draft. He began his career with the A ball Brooklyn Cyclones where hit three HRs & drove in 29 runs while batting .277 in 74 games. In 2009 he was at A ball St. Lucie hitting .274 before getting pushed up to AA Binghamton. In 2010 he only hit .225 but hit 16 HRs & drove in 60 Runs at Binghamton, getting promoted to AAA Buffalo late in the year. In 2011 he hit .298 at Buffalo with an excellent .403 on base % along with 6 HRs 14 RBIs & 17 doubles but was shut down in the second half of the year with a torn labrum. 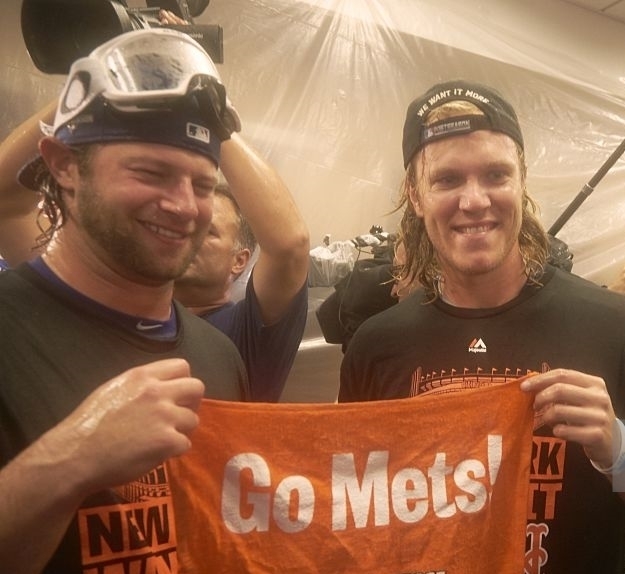 In 2012 he got called up to the Mets squad after just one game to replace the injured Andres Torres. He made his MLB debut in the second game of the season getting two hits in the Mets 4-2 win over the Atlanta Braves. On April 9th he hit a two run HR off Washington's Edwin Jackson in a game the Mets would win on a Daniel Murphy walk off RBI single. He went on a seven game hit streak & ended April batting .325 with seven multi hit games. On April 26th he had a bottom of the 9th inning walk off single off the Marlins Heath Bell to give the Mets a dramatic 3-2 win. 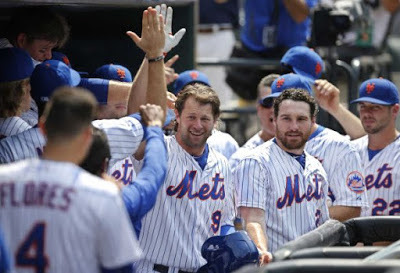 Things went great for Nieuwenhuis as a new member of a surprising 2012 Mets team that was playing well. The long haired California surfer looking kid, became a quick fan favorite & earned the nick name Captain Kirk. Throughout May he kept his average up at .294 & played a fine defensive outfield as well. 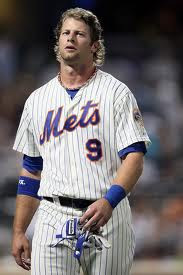 On June 3rd he had three hits, including a two run HR against the St. Louis Cardinals in the Mets 6-1 victory & four game series sweep at Citi Field. 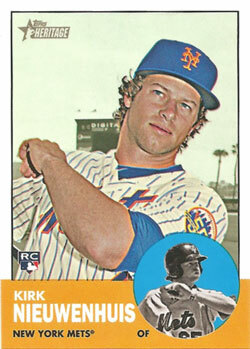 On June 14th in an inter league game at Tampa, Kirk hit two HRs while driving in three runs in the 9-6 New York win. 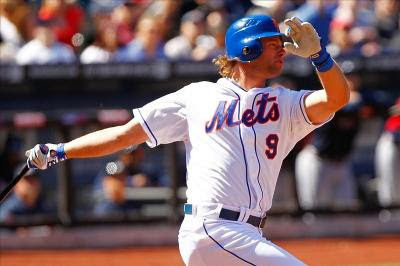 The next day as the Mets returned home, he hit another HR a solo shot in a 7-3 loss to the Cincinnati Reds. 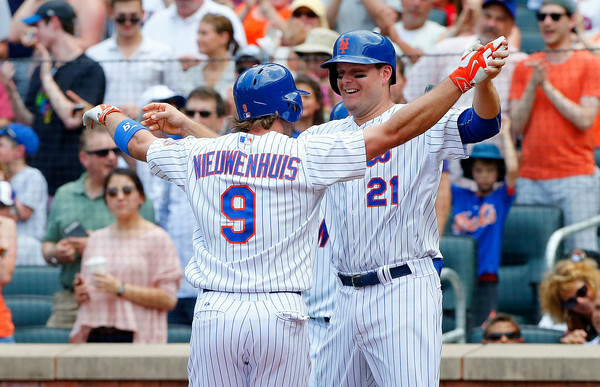 Nieuwenhuis went into July batting .275 with 7 HRs & 26 RBIs. But in the month he went just 4-39, with two RBIs & his average fell to .252. He was striking out often enough to put him in the NL's top ten as well (98 Ks in 282 at bats). By August 1st he was back down at AAA Las Vegas for the rest of the year. With the Mets he had played a good outfield making four assists posting a .982 fielding %. 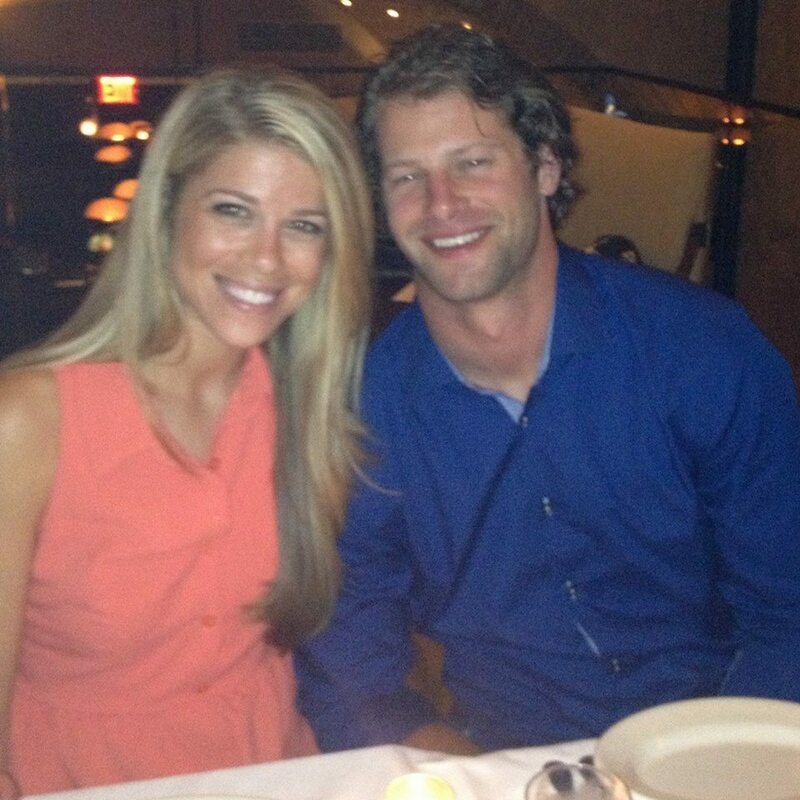 In 2013 he made the club out of Spring Training as a backup outfielder. He made a pinch hit appearance on Opening Day but in the month of April was only batting .125 & was sent back to AAA Las Vegas. He returned to the Mets on June 9th. On June 16th, he was the hero of the game when he hit a walk off three run HR at Citi Field, off the Chicago Cubs Calos Marmol. In July he hit two more HRs, but both coming in Mets losing efforts. On July 5th at Miller Park in Milwaukee, he had one of his most productive days in the big leagues, gathering four hits & five RBIs, helping Jeremy Hefner to a 12-5 win. In the 1st inning he walked with the bases loaded, then in the 3rd singled with the bases loaded to score two more runs. In the 4th he had another RBI single, topped off with a 9th inning Triple scoring David Wright. On July 27th, he was sent back down to AAA Las Vegas as Jenry Mejia was added to the 25 man roster. Kirk hit hit .248 with 14 HRs & 37 RBIs in 74 games there. 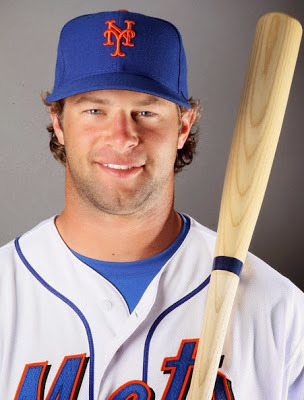 In 2014 the Mets had an over supply of outfielders from off season transactions & Nieuwenhuis was the odd man out, starting out in Las Vegas.He got called up when Chris Young went down with injury, and in his return hit a three run HR in his first at bat. He had a three hit day in a 9-0 win over the Arizona D-backs. His numbers fell off & he was sent back down at the end of April batting .222. 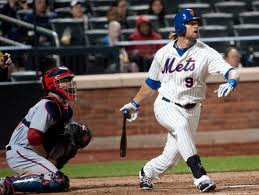 He was brought back up to the Mets squad in late June, getting a hit in his return as a pinch hitter on June 20th. On June 22nd he got a start & got a pair of hits with an RBI in an 11-5 Mets win. On July 7th he hit a HR & drove in two runs later in the week, in the Mets series sweep at Atlanta. Kirk kept his average above .300 until July 12th. After that he went 0-11 falling to .246. He was sent back down to AAA Las Vegas on July 23rd. He returned on August 5th & hit safely in three of his first four games upon return. In the first game he drove in a run in the Mets 6-2 win over the Nats. In September he helped the Mets to a 4-3 win over the Marlins in Miami. He finished the year at .259 with 3 HRs 14 doubles & 16 RBIs. In 2015 he struggled mightily batting just .079 through the end of May. His contract was purchased by the Los Angeles Angels where in ten games he hit .136 (2-24) & was placed on waivers. He was picked up again by the New York Mets & sent to AAA Las Vegas. There he hit ten HRs from June 16th to the end of the month in eleven games. He was brought back up on July 6th & hit an RBI double in a 3-0 Jonathan Niese shut out at San Francisco over the Giants. On July 11th he made Mets history at Citi Field as he became the first Met to ever hit three HRs in a home game. 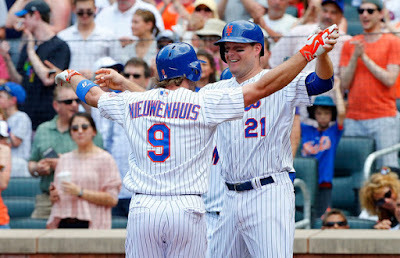 In 53 seasons Nieuwenhuis became the tenth Met to hit three HRs in a game, but never before had any one done it at home. 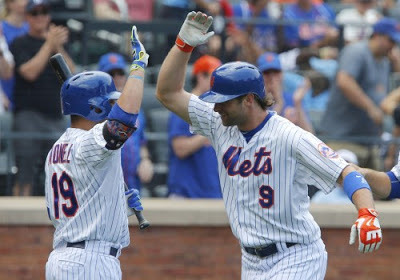 The Mets won the game 5-3 in their final game before the All Star break. They finished the first half of the season in second place just two games out. Quotes: "It's been a wild ride, for sure today was a lot of fun." 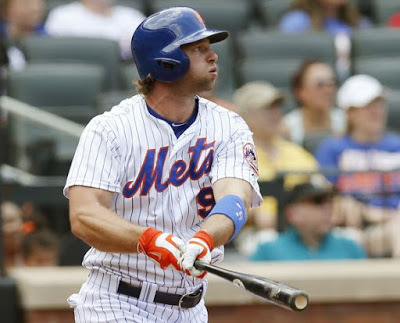 On July 22nd he drove in two runs in Mets 4-3 loss to the Washington Nationals. On July 25th he had another one of his biggest games. He had four hits, three singles & a double, while driving in four runs in the Mets 15-2 romp over the Los Angeles Dodgers.Kirk had one more heroic game in him coming on September 8th at Washington D.C.
With the score tied at seven, he came in to pinch hit in the bottom of the 8th inning against Nats closer Jonathan Papelbon. 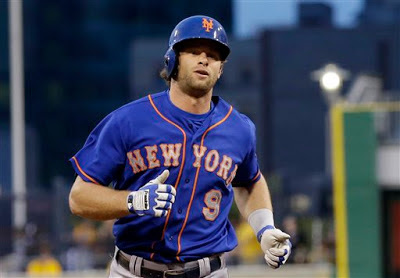 Nieuwenhuis connected for his fourth & final HR of the year, the run proved to be the game winner as the Mets went on to the 8-7 win pulling six games ahead of Washington in the standings. He closed out the year batting just .195, with the Mets he hit .208 with 4 HRs 9 doubles & 13 RBIs in 64 games. 2015 Post Season: In the NLCS against the Chicago Cubs, Nieuwenhuis came on in the 5th inning of Game #4 & stayed in the game going 0-2 but was on the field as the Mets celebrated the clinching of the NL Pennant. In the World Series he got pinch hit at bats in Games #1 & #3 going hitless. He finished off Game #4 playing in centerfield coming in as a 9th inning defensive replacement. In December he was placed on waivers & was picked up by the Milwaukee Brewers where he was the Brew Crews main centerfielder in 2016. He went 0-10 against the Mets at Citi Field in a May series. In 125 games he batted just .209 & struck out 133 times, but did hit 13 HRs with 18 doubles & 44 RBIs. In 2017 he had a horrendous April batting just .088 & was sent down to AAA Colorado Springs where he was batting .217 through July. In a six year MLB career, the outfielder has played 413 games with a.20 batting average, hitting 31 HRs with 215 hits 59 doubles 20 stolen bases & 117 RBIs.